Venerable Madawala Seelawimala Mahathera (Bhante Seelawimala), was ordained as a novice monk in Sri Lanka when he was ten years old. He was ordained by the Most Venerable Dhamma Master Hendiyagala Sri Seelaratanabhidhana Nayaka Maha Thera of Ancient Cave Temple in Kurunegala District Sri Lanka, who was one of the most revered Dharma teachers in Sri Lanka at the time. At age eleven he entered Maliyadeva Boys’ College became the only young monk who went through secular education in Sri Lanka. During this period he grew up under the supervision of Venerable Dr. Dickwela Piyananda who started the Washington Buddhist Vihara, the first Theravada Vihara in North America, with the collaboration of Sasana Sevaka Society of Sri Lanka. He received his higher ordination at age twenty in 1968. He received his bachelor’s degree in Buddhist Philosophy 1971 from University of Sri Lanka, Peradeniya. In 1974 he received his Masters Degree at the same university. By the invitation of late Reverend Tsuji, the Bishop of the Buddhist Churches of America, the largest Buddhist organization in America, Bhante came to the United States to teach Theravada Buddhism at the Institute of Buddhist Studies (IBS) in Berkeley, California in 1976. 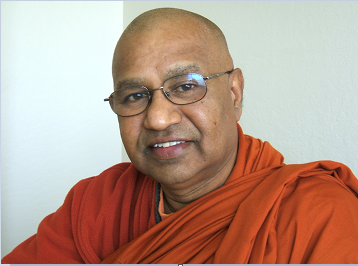 Since then Bhante has been teaching at IBS and the Graduate Theological Union affiliated with the University of California Berkeley. With his master, Venerable Dickwela Piyananda, he helped establish the Toronto Buddhist Vihara in Canada in 1982; he was instrumental in managing that Temple for first five years since the beginning. Subsequently he established Buddhist Vihara in British Columbia in Vancouver, Canada. He assisted in establishing the Buddhist Vihara in San Jose, California. In 1996 he established the ABS Temple at Sacramento. Currently he is assisting Buddhist groups in Arizona and Edmonton, Canada towards setting up centers. Bhante travels widely throughout the United States, Canada, and Asia to give lectures, Dhamma talks, and retreats.